Your list of things to see and do now includes Chocolatl, Starbikes Rental, Leidseplein, and other attractions. Eschew the tourist crowds and head to Food Tours and Flower Market / Bloemenmarkt. It doesn't end there: appreciate the extensive heritage of Begijnhof. To see where to stay, more things to do, reviews, and more tourist information, use the Amsterdam itinerary maker. Bangkok, Thailand to Amsterdam is an approximately 15.5-hour combination of car and flight. The time zone difference moving from Indochina Time to Central European Time is minus 6 hours. Plan for much colder temperatures traveling from Bangkok in May, with highs in Amsterdam at 20°C and lows at 10°C. Wrap up your sightseeing by early afternoon on the 19th (Fri) to allow time for the train ride to Antwerp. On the 20th (Sat), see the interesting displays at Museum Mayer van den Bergh, wander the streets of Zurenborg, then look for gifts at GERETTI Jewellery & Diamonds, then take in the architecture and atmosphere at Saint Paul's Church, and finally admire the landmark architecture of Carolus Borromeus Church. To find other places to visit, photos, maps, and more tourist information, use the Antwerp trip planner. Take a train from Amsterdam to Antwerp in 1.5 hours. Alternatively, you can drive; or take a bus. In May, daytime highs in Antwerp are 20°C, while nighttime lows are 10°C. Finish up your sightseeing early on the 21st (Sun) so you can go by car to Bruges. You'll explore the less-touristy side of things at De Panne Beach and The Old Chocolate House. Explore Bruges' surroundings by going to Atlantic Wall Museum (in Ostend) and Patershol (in Ghent). There's lots more to do: look for gifts at The Chocolate Line Bruges, take in the spiritual surroundings of St Salvator's Cathedral, take an in-depth tour of Torture Museum Oude Steen, and enjoy unforgettable views with a balloon tour. To see photos, other places to visit, more things to do, and other tourist information, read Bruges itinerary builder. Getting from Antwerp to Bruges by car takes about 1.5 hours. Other options: take a train. In May, plan for daily highs up to 18°C, and evening lows to 9°C. Wrap up your sightseeing on the 24th (Wed) early enough to drive to Luxembourg City. Eschew the tourist crowds and head to Caves St Martin SA and The Family of Man. 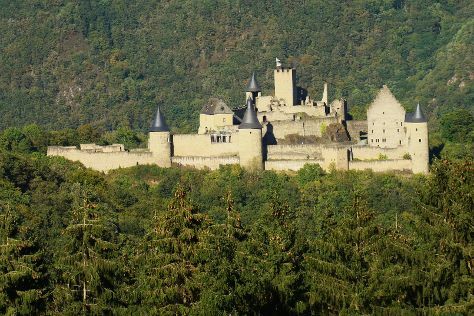 You'll find plenty of places to visit near Luxembourg City: Beaufort Castle (in Beaufort), Casino 2000 (in Mondorf-les-Bains), Bourscheid Castle (in Bourscheid), Abbaye Saint-Maurice de Clervaux (in Clervaux) and Abbey of Echternach (in Echternach). The adventure continues: whizz through the canopy at some of the top local zipline courses and adventure parks, meet the residents at Parc Merveilleux, and explore the fascinating underground world of Petrusse Casemates. To find reviews, traveler tips, and tourist information, refer to the Luxembourg City vacation trip planner. You can drive from Bruges to Luxembourg City in 3.5 hours. Alternatively, you can do a combination of train and bus; or take a train. In May, daily temperatures in Luxembourg City can reach 20°C, while at night they dip to 9°C. Finish up your sightseeing early on the 28th (Sun) so you can travel to Alle-sur-Semois. On the 28th (Sun), explore the fascinating underground world of Grottes de Hotton and then contemplate the waterfront views at Eau d'Heure lakes. Get ready for a full day of sightseeing on the next day: don't miss a visit to Redu Village du Livre, pause for some serene contemplation at Basilique Saint-Hubert, and then sample the tasty concoctions at Orval Brewery (Brasserie d'Orval S.A.). To find more things to do, photos, traveler tips, and tourist information, read our Alle-sur-Semois trip planner. Traveling by car from Luxembourg City to Alle-sur-Semois takes 1.5 hours. Finish your sightseeing early on the 29th (Mon) to allow enough time to travel back home.